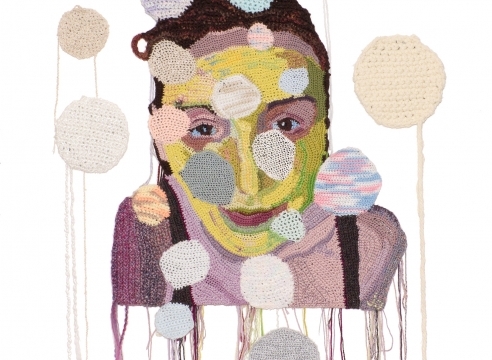 Jo Hamilton’s crocheted portraiture is a fascinating combination of traditional technique with contemporary subject matter. A native of Scotland, Hamilton earned a degree in painting and drawing from the Glasgow School of Art, but after moving to Portland, she translated her artistic vision into the medium of crochet, which she had first learned as a child from her grandmother. She has made large-scale cityscapes as well as larger than life portraits, ranging from friends, to commission subjects, to mugshots of people processed through the Multnomah County Jail. The oversized portraiture is the focus of her work in our show, and they will captivate viewers with their nuance. Jo Hamilton’s first solo show at Laura Russo Gallery will feature a range of colorful and dynamic two and three dimensional portrait-based crochet works, ranging from people she knows to more anonymous mugshots to mannequin masks.